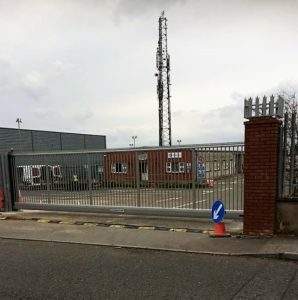 Inova Gates Limited have just completed a Sliding Gate and Security Fencing installation for ESB Networks in Drogheda, Ireland on behalf of Conwell Contracts Ltd. 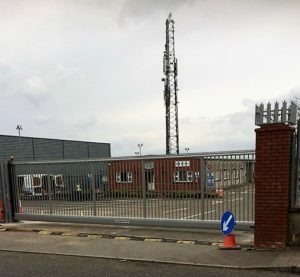 The project comprised of a new Cantilevered INOVA 280 ESI Model Sliding Gate 2400mm high with a clear opening of 10,000mm with a serrated edge spike to the top of the gate for added security. The gate was finished in the Inova exclusive Inometallic Colour PPC. 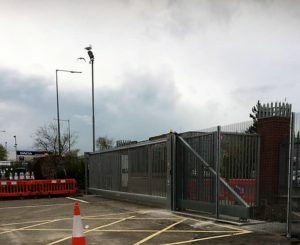 In addition to the Sliding Gate we installed new bespoke infill panels to the sides of the gate with the added serrated edge and flat plate bottom to replicate the gate lower beam. 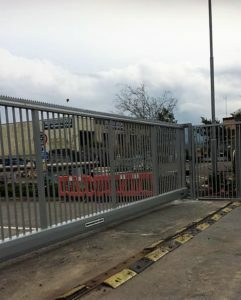 A 358 High Security mesh cage was also added to this project to the secure the gate area. 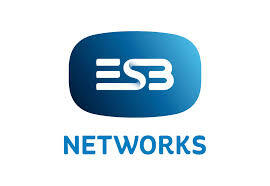 Inova Gates take pride in providing another complete security package around an ESB Networks Premises, with the Inova Sliding Gate being one of the preferred gate systems used by ESB.